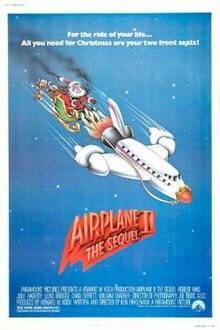 Airplane II: The Sequel (titled Flying High II: The Sequel in Australia, New Zealand, South Africa, Japan, and the Philippines) is a 1982 American parody film. It is the sequel to the 1980 film Airplane!. Released on December 10, 1982, the film was written and directed by Ken Finkleman and stars Robert Hays, Julie Hagerty, Lloyd Bridges, Chad Everett, William Shatner, Rip Torn, and Sonny Bono. The team who wrote and directed the original Airplane! (Jim Abrahams, David Zucker, and Jerry Zucker) had no involvement with this sequel. Paramount, having faced a similar situation with Grease 2 earlier in that year, hired Finkleman, who wrote Grease 2, to write and direct Airplane II as well. In the near future, the Moon has been colonized and supports a station on its surface. A lunar shuttle known as Mayflower One is being rushed to launch from Houston. The head of the ground crew, The Sarge, does not like what is occurring, but he defers to the airline's management. On the flight crew are Captain Clarence Oveur, navigator/co-pilot, Unger, and first officer/flight engineer, Dunn. Also on board is computer officer Elaine Dickinson. Elaine has long left Ted Striker, and is now engaged to one of the flight crew, Simon Kurtz. Ted has in the meantime been committed to an insane asylum. He was declared mentally incompetent in a lawsuit following a test flight that Ted piloted and in which the lunar shuttle crashed. Ted believes that the lawsuit was used to silence him, because he knew there were problems with the lunar shuttle that made it unsafe. He is once more haunted by his actions in "The War" – causing a relapse of his "drinking problem", specifically the events that took place over "Macho Grande", where he lost his entire squadron. When Ted reads of the upcoming lunar shuttle launch, he escapes the asylum and buys a ticket for the flight. During the flight, Mayflower One suffers a short circuit, causing the artificially intelligent computer, ROK, to go insane and send the ship toward the Sun. Unger and Dunn try to deactivate the computer, but are blown out of an airlock. Oveur tries to stop ROK, but the computer gasses him. Simon abandons Elaine and leaves in the only escape pod. Once again, Ted is called upon to save the day, but first he has to figure out how to make the computer relinquish control. Steve McCroskey; the air traffic controller, reveals that a passenger, Joe Seluchi, had boarded Mayflower One with a bomb in a briefcase, intending to commit suicide so that his wife can collect on insurance money. Ted manages to wrestle the bomb from Joe, and uses it to blow up ROK and set course for the Moon as originally intended. Using the bomb to destroy the computer causes collateral damage to the shuttle, so the flight is not out of danger yet. On the way to the Moon, control of the flight is shifted to a lunar base, commanded by Commander Buck Murdock. He has a high level of contempt for Ted because of Macho Grande, but agrees to help anyway. They manage to land the craft on the Moon. Ted and Elaine fall back in love and are married at the end. After the wedding, Joe looks into the cockpit and asks for his briefcase back. A postcredit scene shows a screen that says "Coming From Paramount Pictures: Airplane III". Murdock is then seen saying "That's exactly what they'll be expecting us to do!" Variety magazine commented that "It can't be said that Airplane II is no better or worse than its predecessor. It is far worse, but might seem funnier had there been no original." Roger Ebert gave the film two out of four stars, saying it "never really seems to know whether it's about a spaceship. It's all sight gags, one-liners, puns, funny signs and scatological cross-references." On review aggregator website Rotten Tomatoes, the film received an approval rating of 42% based on 19 reviews, with an average rating of 5.3/10. On Metacritic, the film has a weighted average score of 48 out of 100 based on 9 critics, indicating "mixed or average reviews". ^ "Airplane II: The Sequel". PowerGird. Archived from the original on 8 May 2016. Retrieved 4 April 2013. ^ Variety staff (1 January 1982). "Review: 'Airplane II the Sequel'". Variety. Penske Media Corporation. Retrieved 15 September 2017. ^ Ebert, Roger (13 December 1982). "Airplane II – The Sequel Movie Review (1982)". RogerEbert.com. Retrieved 15 September 2017. ^ "Airplane 2 - The Sequel (1982)". Rotten Tomatoes. Fandango. Retrieved 3 July 2018. ^ "Airplane II: The Sequel Reviews". Metacritic. CBS Interactive. Retrieved 3 July 2018.